The Restoration Hardware catalog is a home decor catalog / furniture catalog that features high-quality furniture, textiles, hardware, linens, rugs, drapery, wall decor, and accessories. The Restoration Hardware catalog is incredibly styled and you'll get all kinds of inspiration on how to decorate your home in the classic style of Restoration Hardware. You can request that a free Restoration Hardware catalog be mailed to you by visiting Restoration Hardware's Request a Catalog page. On that page might be several different catalogs. The ones that have a "Subscribe" box can be mailed to you, so just place a check in the box next to whichever catalog you want. You can get more than one catalog at once by just checking all the catalogs you're interested in. The last time we checked, some of the free catalogs you can get include RH Interiors, RH Modern, RH Outdoor, RH Baby & Child, and RH Teen. Then, fill out the form at the bottom of the page with your first and last name and the full mailing address for where the Restoration Hardware catalog should be sent. There's also a space for a phone number and email address but you don't have to provide those. Note: If you do provide your email address, be sure to take notice as to what you're signing up for. You can check either the RH or RH Modern box to get emails regarding one or both of those catalogs. If you ever want to stop these emails, you can unsubscribe here. When you're done, click the REQUEST SOURCE BOOK button to send in your request for the free catalog. You will receive your first Restoration Hardware catalog in the mail within 1-2 weeks. Tip: If you ever want to stop receiving catalogs from Restoration Hardware, you can do so by filling out a form on their Cancel Catalog Delivery page. The Restoration Hardware catalog can be mailed to the United States, APO/FPO, and Canadian addresses. If you don't have an address that falls in one of those categories, you might still be able to view the catalog online by following the instructions below. The Restoration Hardware catalog is available online too, through the same Request a Catalog page linked to from above. Not all of the Restoration Hardware catalogs can be seen online, but you can tell which ones can by looking for the "View Online" link on the bottom of each catalog's thumbnail. 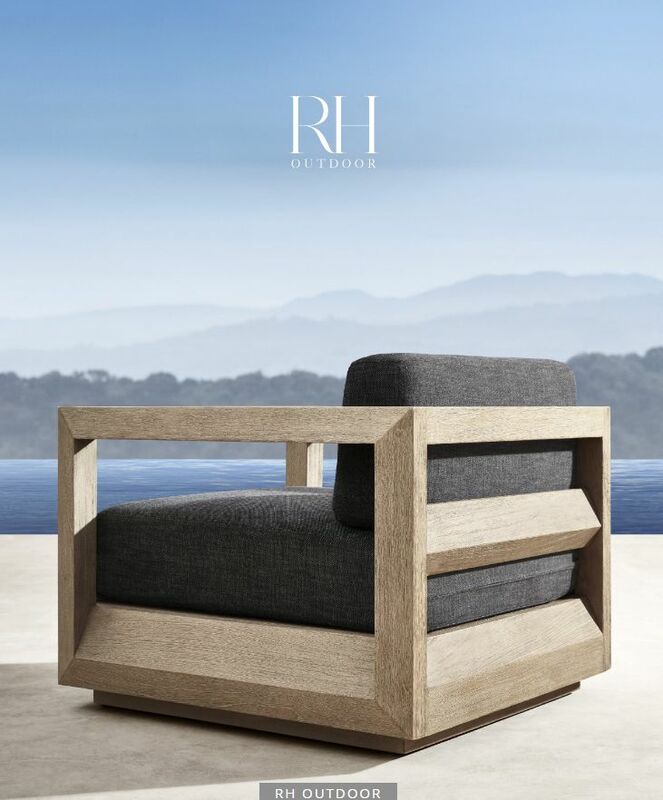 As of this writing, you can view the following Restoration Hardware catalogs for free through the link above: RH Modern, RH Outdoor, RH Small Spaces, RH Lighting, RH Linens, RH Bath, RH Rugs, RH Baby & Child, and RH Teen. Once you've opened one, you click on the pages to zoom in and use the arrows on the left and right of the pages to read through the catalog. At the bottom of the catalog are some additional controls for printing pages of the catalog, searching for text, or even sharing the whole catalog or screenshots via email and social media sites. Another menu to the left of the catalog holds the table of contents. Another way to buy from Restoration Hardware is to use their website at Restorationhardware.com. The benefit of shopping this way is that you can view all their products in a neat, organized manner at any time, and then purchase whatever you like through their website. Some of the menus where items are categorized include Living, Dining, Bed, Bath, Lighting, Tableware, Windows, Rugs, Decor, Hardware, Outdoor, and Gifts. At the top of the Restoration Hardware website are links to other websites like Rhmodern.com and Rhteen.com. The online Restoration Hardware catalogs mentioned above can also be viewed from Android, iPhone, and iPad devices through the Restoration Hardware Source Book app.